I was browsing Stockopedia the other day and came across an article on Next. I like Next – it’s a clear success story and an excellent company. Aside from the interesting article itself, there was also a fascinating comment about the quality of the team and processes at Next, with evidence taken from their Annual Report. I’ve never actually taken the time to read one of their annual reports – which is a failing of mine, as I think you get a lot from reading the annual reports of demonstrably successful companies. It’s subject to a lot of hindsight bias, of course, but given how many annual reports of pretty poor companies a value investor will usually end up reading, there might be something of a benefit in a ‘compare-and-contrast’! The explanation itself is pretty elementary – it’s just a simple observation that you have alternative uses for your cash, and optimising shareholder returns is always about using your cash in the best way. There’s lots that can be added to the above analysis, and criticisms you can level at it, too – notably that Next is a company with such great returns on tangible capital that, in reality, share buybacks are significantly worse than organic growth. On that front, actions speak louder than words – buybacks have been fairly restrained, and investment in organic growth has been substantial, accretive, and careful enough that (unlike so many) growth has been executed consistently and without the usual bloating of central costs, diminishing returns on marginal capital and general organisational ‘fatigue’ that you see so much elsewhere. But aside from that – even aside from the fact that Next have successfully executed their buyback plan to the great enrichment of long-term shareholders – there’s an even more fundamental point that comes to mind. I think you significantly beat the market over a 5-10 year period if, with absolutely no other criteria, you just invest in companies which actually talk about the benefits and reasoning behind good capital allocation. It’s deeply worrying how few companies either acknowledge or consider the possibility of share buybacks, or actually spend any time talking about logical investment planning in acquisitions, with respect to return on investment and what else they could do with the money. One piece of logic; (which seems scarily prevalent in US companies) that any acquisition which is earnings accretive must automatically be a good thing, is so ridiculous it doesn’t even bear considering. Some of these discrepancies doubtless come about from the principal-agent problem; the fact that CEOs have a much more vested interest in enriching their personal domain and building their legacy than conservatively maximising long-term returns. My little suspicion – that management teams which talk about capital allocation deliver better returns – is interesting from the perspective that it might not even need good capital management to be true. I suspect that simply the fact that management acknowledge its importance is well correlated with management being switched on and alert in other respects. The argument is more or less unprovable, I guess, and again I note that it is subject to a great deal of survivorship and hindsight bias. It’s easy to pick up an annual report of Next, a great company, and then essentially ‘data mine’ for variables which you then suppose are positively correlated with that success. Still, it’s my hunch. Good capital allocation is much, much rarer than I would hope, and I think that makes it a particularly valuable asset. If an acquisition is earnings accretive net of (sensible) goodwill depreciation, doesn’t it capture the very thing you’re looking for? I don’t really follow your point, sorry. Accretive acquisitions, as I see the term commonly used in the US, seems to mean that you bought something with a lower P/E than the shares you issued with which to buy the firm, since this mathematically will increase earnings per share. Or am I misunderstanding your argument? I would add to that that you must also look for companies that don’t just talk about it but actually do as the say. There are some companies that talk the good talk but have actions contrary to what they’re saying. I suspect you’ll do better even by my broader standards, but I’m vigorously with you in principle. Your subset is a much better one to invest in, if you can find said companies fairly valued! – past auditor hasn’t picked up supplier rebates as a risk area, hopefully the newly appointed one will take a look.. Thanks SA, look forward to keeping up with the blog. I sort of buy the stuff you’re highlighting, but I don’t have a super strong opinion on the M&S food business (which I’ve always heard from analysts was a bit of a gem, Waitrose-esque) or the quality of business generally. I’m with you on the exceptionals, but they’re nowhere near as a bad in scale as some I’ve seen. As for sale-and-leaseback; I agree again, but the amount doesn’t look particularly worrying… and it doesn’t affect my analysis anyway, since I capatalise leases in my internal calculations. Looking back 10-15 years, M&S is just a lower quality business. Barring any big blow-ups in M&S, I’m not convinced the story will play out too differently from what you’d expect from shorting a low RoIC business and going long a high RoIC equivalent – if the sector expands, the high RoIC will outperform, and if the sector contracts (slowly, preferably), the low RoIC one will. And I’m unsure there is any sectoral growth there to drive an outperformance of the better company. 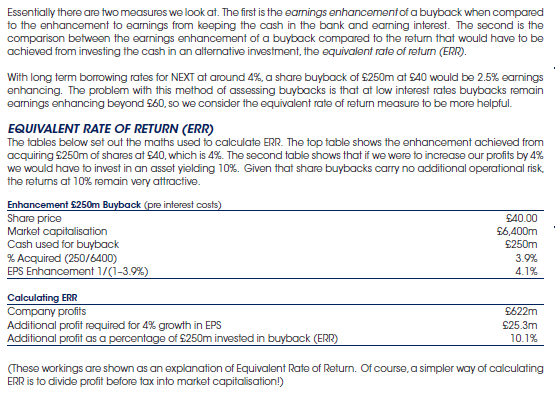 Having said all of that, M&S’s valuation is really very rich… so from a market sentiment perspective, sure, it’ll only take one bad LfL figure and everyone will be valuing it on a 12x earnings again!